These are lyrics by Daft Punk that we think are kind of repetitive. Daft Punk's, "Around The World"
This is all the song ever says! 'Da funk back to the punk, come on! That pretty much serves as the bassline for the entire song. Daft Punk's, "Doin' It Right"
The song is almost 7 minutes long. I think this beats Around the World, because its only this one word... repeated for about 6 straight minutes in total. No breaks like Around the World, either. Great song, though. Daft Punk's, "Harder Better Faster Stronger"
Work it harder, make it better, do it faster, makes us stronger, more than ever, hour after, our work is never over. You should all know this. Those lyrics are bent and scratched around as the melody for the entire track. That line is essentially used as percussion. It's repeated throughout the entirety of the track. That wall of text is the entirety of the song, excusing some scarce breaks with the line "technologic". Daft Punk's, "Television Rules the Nation"
Much like the rest of this album, the line is repeated for almost all of the song. That line is repeated in a spookily distorted voice for a good amount of the song. 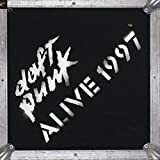 Daft Punk's, "The Prime Time Of Your Life"
Like many other tracks from this album, there is only one line repeated throughout the entirety of the track. That line is repeated for a large portion of the already 10-minute-long song.